Skype offers the chance to stay connected with your family and friends. However, at times, you might delete some important Skype chats accidentally. If you are looking for a solution to recover deleted Skype messages on iPhone, then this article is for you. Recovering data from iPhone no matter how you lost them. Supporting over 22 file formats for easy recovery, such as Contacts, Text messages and Photos. Intelligent recovery mode that automatically chooses the best option for retrieving data. Previewing the recovery files before beginning the recovery process. Supports the different models of iPhone, iPad, and iPod touch, compatible with even the latest iOS 11 and much more. Step 1: Download the trial version from the above download buttons. Install the program, launch it, and from the main screen select "Recover from iOS Device" option. Step 2: Here, you have to select "Skype" under Third-party IM App option. And click the "Next" button to connect your iPhone to the computer. Step 3: Once iMyFone D-Back detects the device, click "Scan" button. And when the program finishes scanning the device, you will be able to see the recoverable Skype messages on the interface. You can preview only the deleted content by selecting "Show only the deleted files" option. Proceed by selecting the files you wish to recover and click the "Recover" button to recover Skype messages on iPhone. Step 4: A dialogue box appears asking for a folder to save the recoverable files. Choose a folder on your computer and wait for the program to complete the process. And then, you can browse the folder to view the lost or deleted Skype messages for your iPhone. 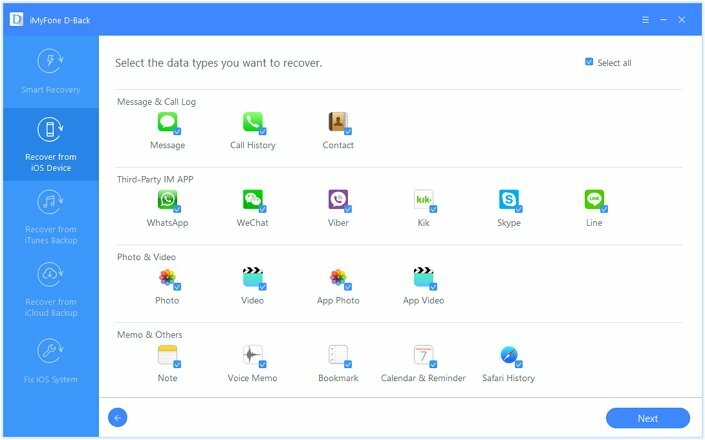 Apart from recovering lost data from your iPhone directly, you can also recover Skype chat history on iPhone from the backup files created in iTunes and iCloud. 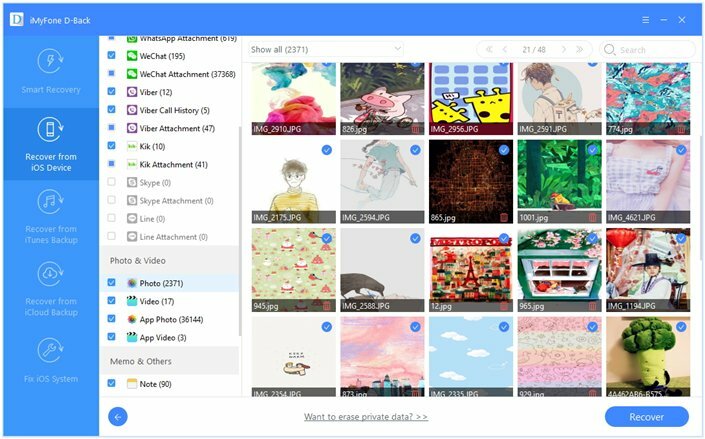 iMyFone D-back is capable of extracting selective content from the backup files without the hassle of downloading the entire backup. We will be looking at how to recover Skype history on iPhone from iTunes backup files. 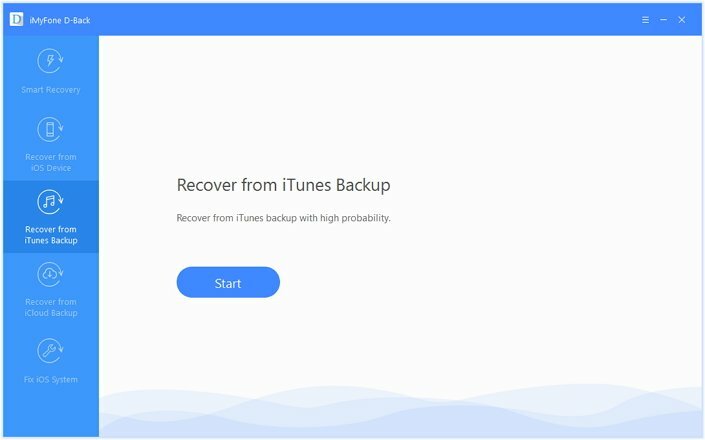 Step 1: From the interface of the program, select Recover from iTunes Backup option. Choose the file types that you wish to recover. In this case, choose Skype, and click "Next" button. 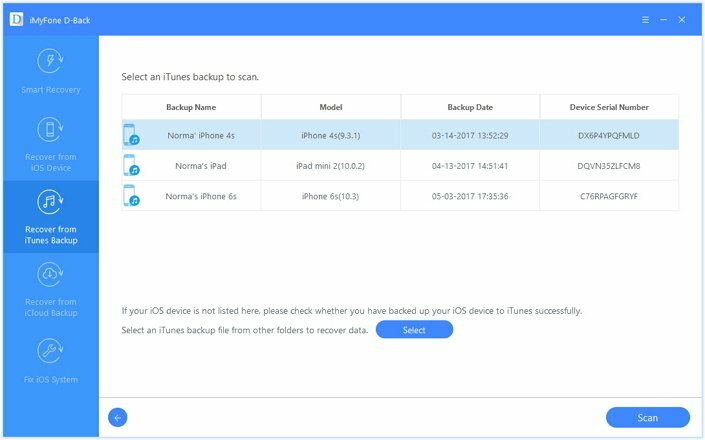 Step 2: In the next screen, you will have to select the preferred iTunes backup file from that you want to recover deleted Skype messages on iPhone. Once selected, click the "Scan" button. The time taken to scan will be dependent on the size of the backup file. Step 3: After scanning is complete, you will see the results in the interface window. Browse the files according to the requirement, or select Only show the deleted files option to see the deleted content from the Skype message history. Once selected, click the "Recover" button. Step 4: A small dialogue box appears asking you to select the folder where you would like to save the files. Once selected, iMyFone D-Back will recover Skype messages on iPhone onto the selected folder. Wait for the program to complete the process. And your Skype messages are back. Of course, you can recover Skype chat history on iPhone from iCloud backup, also. And the specific process is similar with Recover from iTunes Backup. With simple methods like iMyFone D-Back iPhone recovery tool Windows or iMyFone D-Back for Mac iPhone recovery tool, how to recover deleted Skype messages on iPhone can be easy, even though you use the latest iOS version 11. The recovery tool and process explained in this article will help you understand the importance of possessing a recovery software and the necessity to create a backup from time to time. However, we often tend to take things for granted until the last minute. Fortunately, the trial version are free offered here for both Windows and Mac users, which you can confirm whether iMyFone D-Back can find you Skype messages. Just download and have a try! Good software! Found my skype messages back! But i hope it can recover more apps, such as facebook and twitter. Hello Carolyn, thanks for your feedback. iMyfone D-Back doesn’t support recovery from Facebook and Twitter apps right now. You can use the software for Skype, WhatsApp, Wechat, Kik message apps. I will pass along your comment to our development team. Thanks a lot for your suggestions! Thanks, for this. I had been trying to sort this out for hours until I read this. Thanks. This is exactly what I needed! I followed this article and it worked! I got my messages back, and retrieved important information! The step by step was perfect for me as I am a visual learner. Saving this website for later! Thank you!! !